MANSFIELD, Mass. – Mansfield coach Mike Redding has North Attleboro roots. Although he has been in charge of the Hornets for over 25 years and bleeds green, he took a moment after Friday night’s installment of this fierce rivalry to go to the Rocketeers celebrating at Alumni Field and congratulate them on the league title and urge them to bring home the Div. 3 state title. It was a classy move by the Mansfield coach at the end of another emotional matchup between longtime rivals and perennial title challengers that North Attleboro won 14-13 to clinch the Kelley-Rex title outright and potentially the No. 1 seed in Div. 3 Southwest. The win gives North Attleboro its first league title since 2011 and its first outright Hockomock title since 2008. Once again, as has been the case all season, it was the Rocketeers defense that came up with the plays to win the game. Leading by just a point with time winding down in the fourth quarter, North punted. Mansfield took over at its own 37 with less than five minutes remaining. The Hornets got to the Rocketeers 33 and threw incomplete on first down. On second and 10, North dialed up a blitz and Bobby Mylod shot the gap to stuff Brian Lynch for a six-yard loss. On third down, the Rocketeers came again and sacked Anthony DeGirolamo for a seven-yard loss back to the 46. On fourth down, Kyle Gaumond leapt and swiped the ball out of the hands of Hunter Ferreira to end the drive. 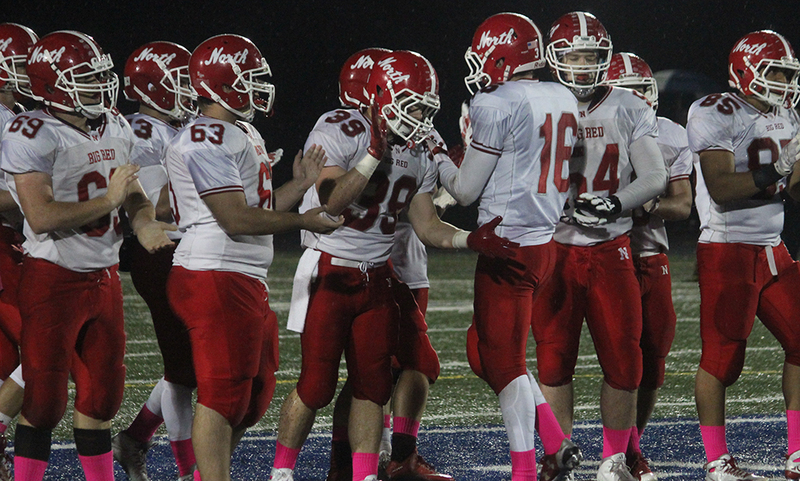 North Attleboro ran out the clock and celebrated the victory. The Rocketeers offense looked great at the start of the game. Against a Mansfield defense that has been solid all season, North took the opening kickoff and marched 67 yards on 14 plays to take the lead. Nick Morrison (12 carries, 68 yards) was big on the drive with six rushes, including a crucial fourth down and one gain of seven yards near midfield. Sophomore quarterback Chad Peterson showed off his arm hitting Davon Andrade for 18 yards and then snuck a shovel pass to Mylod on fourth and one from the four for the go-ahead score. North Attleboro would not get another first down until its second possession of the third quarter. Mansfield was not able to get much going offensively but got a little spark right before the half. Ben Budwey’s punt return set the Hornets up at the North 37. DeGirolamo (7-11, 165 yards) hit Ferreira for 18 yards and then, following a four-yard loss, hit him again for another 10. The Hornets had to settle for a 23-yard Diogo DeSousa field goal but were on the board and went into the break down 7-3. To start the third quarter, DeGirolamo was strip sacked by Thomas Reynolds and Thomas Kummer jumped on the loose ball at the Hornets 37. But the Mansfield defense forced a turnover on downs, helped in part by Joe Bukuras’ tackle in the flat on Nick Dean for a four-yard loss on third and one. The Hornets offense took advantage of the momentum swing and drove 71 yards on eight plays to take Mansfield’s first lead. 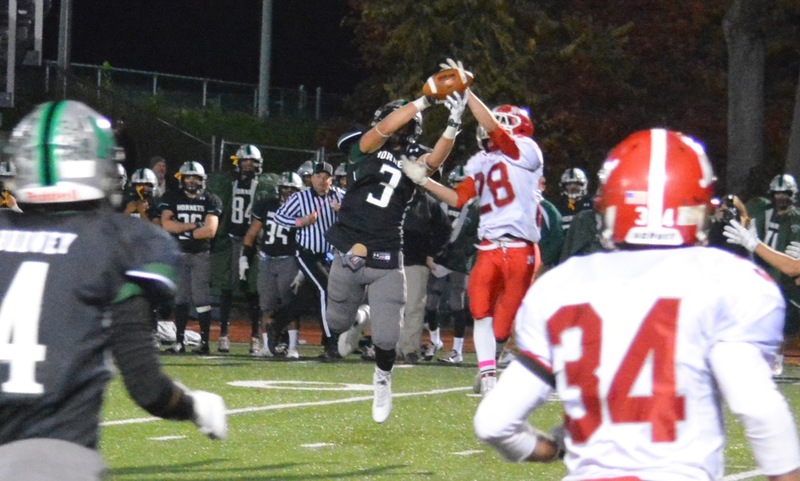 DeGirolamo and Ferreira (six catches, 164 yards) hooked up for a 32-yard completion into North territory and then combined again on a 12-yard touchdown pass to the front pylon that put Mansfield ahead 10-7. 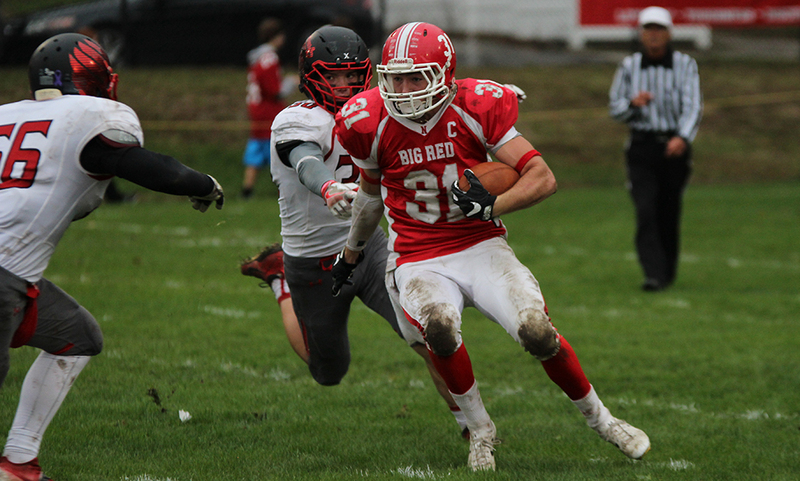 The lead was short-lived, as North Attleboro showed its resiliency to bounce right back. Peterson hit Ridge Olsen on the far side of the field for 14 yards and Nick Rajotte got 11, before Morrison broke free down the North sideline sprinting past his cheering teammates and the Hornets defense for a 39-yard score. Mansfield was not done. After a Connor Flynn sack pushed the Hornets back to third and 21 from their own 27, DeGirolamo and Ferreira connected on a 64-yard pass (taking advantage of a slip by the defensive back) down to the North nine. Again, the Hornets had to settle for a field goal and trailed 14-13 with 7:58 left. Mylod, Gaumond, and the North defense did enough to stymie the Hornets on their final drive. When a personal foul flag was thrown for a late hit out of bounds on Mansfield with 1:30 left, the game was won and so was the title. He shook hands with the media and walked over to the North Attleboro players. As Mansfield made its way to the locker room, turning its back on the loss and focusing on next week, the Rocketeers stayed on the field taking a couple of moments to savor the win for a few more moments before moving forward.